Warrenpoint teenager Conall Courtney is preparing for a dream chance to compete as a wildcard rider in the Pata European Junior Cup Series this weekend at Magny-Cours in France. The 17-year-old, who won the 2015 Irish and Ulster Production 300 titles, has made a major impression in his first full season of short circuit racing, claiming nine wins and 23 podiums. Conall, whose father Tommy raced in the 400cc class in the nineties, was shocked to receive a wildcard entry after his dad contacted the organisers and is now looking forward to the racing at the famous French venue. The EJC Series is the entry level class to World Superbikes and pits young prospects against each other on identical Honda CBR650F machinery. 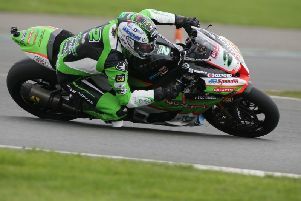 Conall, who is backed by Brian Jones of BJ Mototech, said: “It’s a great opportunity to compete against top level riders and experience a world championship atmosphere. Courtney hopes to compete in the series in 2016-17.